Ensuring that your teeth and gums never need to have major dental treatments. Our hygienists are all highly skilled dental professionals, all chosen for their exceptional ability to deliver our promise of outstanding patient care. Shannon has worked in the Dental Industry since 1995. She first worked as a Dental Assistant in Canberra, ACT, in both the public and private sectors. It was during this time she realised she was passionate about patient care and preventive dentistry. She later completed a Diploma of Dental Hygiene in South Australia, as ‘Most Outstanding’ student. Since graduating as a Dental Hygienist in 2001, Shannon has gained valuable experience in both general dentistry and the specialist field of orthodontics. She also strives to keep abreast of advances in dentistry by attending regular continuing education programmes. 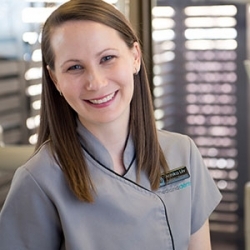 Shannon is committed to providing a gentle and individualised approach to her patient care. She enjoys spending her spare time with her family – Jason and daughters Milla and Ever. As a family they like to keep active. Annika Liiv completed her Bachelor of Applied Health Science in Oral Health at the University of Queensland in 2004. Since graduation, she has gained further experience working as a Dental Hygienist and Dental Therapist in both private and government settings. Annika has a particular interest in children’s dentistry and prides herself on her commitment to providing gentle and comprehensive care to her patients. As an active committee member of the Dental Hygienists’ Association of Australia (Qld Branch) Annika is often involved in planning and hosting continuing education seminars. Annika and her husband, Edward, have two children, Hugo and Adelaide. They love to travel both in Australia and visiting relatives overseas. Annika loves cooking and reading and has studied classical ballet for over 20 years. Eliza completed her Bachelor of Applied Health Science degree in Oral Health at the University of Queensland in 2004. Since graduation she has gained further experience in both public and private settings as both a Dental Hygienist and Dental Therapist. Eliza has extensive experience in the maintenance of crown, bridge and implant dentistry and enjoys providing professional in chair whitening to patients. She is very passionate about helping patients improve their overall oral health, and has a particular interest in the treatment and maintenance of periodontal disease. She also loves treating children, always in a very kind and gentle manner. She is an active committee member of the Dental Hygienists’ Association of Australia (QLD Branch) and contributes to the organisation of continuing education events. She has most recently gained further qualifications and experience in the field of orthodontics. Eliza grew up in the dairy farming region of South East Queensland and loves going home to visit her family and enjoying the country air. She also enjoys team sports such as netball and touch football, and hosting dinner parties. Eliza and her husband, Angus, have a beautiful daughter, Brianna, who was born in 2017. Eliza is currently on maternity leave and will return to Medland Dental in 2019. Susanne completed her Bachelor of Health Sciences at the University of Queensland, graduating in 2007. After graduating she moved to Melbourne where she gained invaluable experience working in a very busy and progressive private practice. 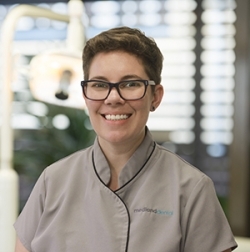 Susanne later returned to Brisbane to be closer to her family, and joined our team of registered Oral Health Therapists and Hygienists in 2014. Susanne brings a wealth of experience and expertise to our team. 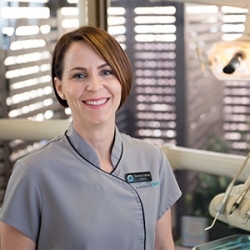 Susanne is very passionate about Oral health and is a firm believer in preventative dentistry. She actively supports dental health in the context of its affect on the body as a whole, and enjoys nothing more than seeing her patients maintaining perfect oral health. Susanne practices in a kind and gentle manner, and strives to make each patients treatment as comfortable as possible. Susanne enjoys getting out and experiencing Brisbane’s cultural scene with events like the ballet and theatre, in addition to be an avid traveler. Ashleigh started her career in dentistry in 2006 as a Dental Assistant. Her passion for providing oral health care led to her obtaining her Bachelor of Oral Health from the University of Queensland in 2013. Since graduating she has worked as an Oral Health Therapist in both the private and public sectors. Ashleigh brings a wealth of experience and knowledge to the Medland team, having extensive experience in all aspects of general dentistry, and in the specialty fields of Pediatrics and Orthodontics. Ashleigh is passionate about sharing her knowledge with patients to help them maintain good oral health and prevent dental issues developing. Ashleigh has great interest in all areas of dentistry, particularly children’s dentistry and periodontics. She takes pride in being a caring and gentle practitioner whilst delivering the highest standard of care to her patients. 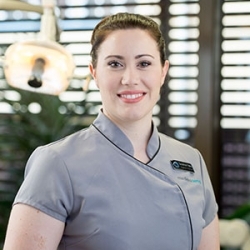 A member of The Australian Dental and Oral Health Therapist Association, Ashleigh enjoys attending regular continuing education seminars and study groups. Outside of work, Ashleigh and her husband, Gavin enjoy travelling the world together, spending quality time with family and friends and dining out. In her spare time Ashleigh enjoys Pilates, hot yoga and watching her husband play reserve grade AFL. Sue has over 25 years experience in the dental industry. 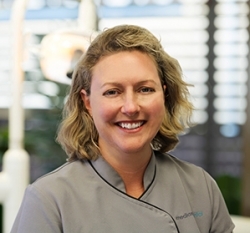 She started working in 1991 as a Dental Therapist with the Queensland School Dental Service. In 2003 she qualified as an Oral Health Therapist, which added dental hygiene to her scope of practice. The additional duties complemented her interest in preventive dentistry and dental health education. 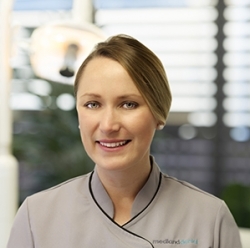 She has practiced throughout South East Queensland and in Sydney, in both government and private practices before joining the Medland Dental team. Sue and her husband Ian have three children who keep her very busy. In her spare time Sue enjoys going to the gym, camping with her family, and has recently started singing with the Churchie Community Chorale. 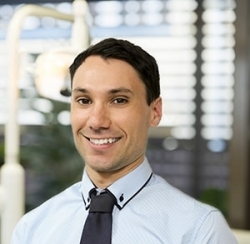 Brad completed his Bachelor of Oral Health from the University of Queensland in 2013. Since graduating, Brad worked for two years in a private practice in Chinchilla, where he was born and raised. Although a country boy at heart, he is looking forward to residing in the city again. The motivating factor for Brad to study Oral Health was his interest in helping people. His greatest satisfaction is having patients confidently smile when they leave the dental practice. Brad enjoys providing thorough, yet gentle scaling, while also helping to educate his patients about the importance of maintaining good oral hygiene. He also has a keen interest in orthodontics. Outside of work, Brad’s main passions are travelling and sport. Before starting at Medland Dental he spent 14 months working and travelling around the UK and Europe. Brad is a keen tennis, squash and touch football player. Rachel commenced her career in dentistry in 2006 as a Dental Assistant in both general and orthodontic practices. Realising that her passion lay in helping others, she went on to achieve her Bachelor of Oral Health from the University of Queensland in 2012. Following her graduation, Rachel relocated to Gympie to work in a busy private practice. Upon returning to Brisbane, Rachel worked in private practice and also with our first nations peoples in a Non-Governmental Organisation. Rachel has a gentle and empathetic approach to dentistry and is passionate about helping patients achieving optimum oral health outcomes. In her spare time, Rachel loves spending time with her nieces and nephews, trying different cuisines, being outdoors and getting crafty with cross stitch projects.